Stop by one of central Maine’s fastest growing farmers markets to pick up all your grocery needs and then some! 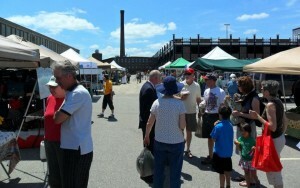 Conveniently located across from Lewiston-Auburn’s beautiful Great Falls and next to the historic Bates Mill 5, the Lewiston Farmers’ Market offers customers a family friendly atmosphere and nearly 25 vendors selling Maine grown and produced products. A visitor to the market will find fresh and chemical-free fruits and vegetables, quality meats, artisan cheese, baked goods, fresh seafood and live lobster, handcrafted soaps and body products, fresh cut flowers, arts, crafts and more! Your Food. Your Community. Your Market. We’re here for you! The Lewiston Farmers’ Market is sponsored by St. Mary’s Health System and is supported by staff and volunteers from the St. Mary’s Nutrition Center; a local and statewide resource dedicated to promoting community health through organizing, advocacy and education. The Nutrition Center has twelve years of experience working to create a sustainable regional food system, involving those affected by inadequate food access as partners and supporting area farms as an essential piece of the local economy. The Lewiston Winter Farmers’ Market will run 10:00am- noon every Sunday at the YWCA, 130 East Avenue, Lewiston from November 4th, 2018 through February 24th, 2019. SNAP/EBT accepted. Contact: Sherie (207)513-3848, lewistonfarmersmarket@gmail.com for more information.